Dark chocolate cupcakes topped with ganache and vanilla buttercream– so rich and smooth because they are flour-less (lets hear it for my gluten-free friends!!)!!! YUM! In a microwave safe bowl, melt chocolate with butter in 30 second increments, stirring between until smooth and creamy. Whisk cocoa powder into melted chocolate. Add egg YOLKS and whisk until smooth. Set aside. Add a pinch of salt to the egg whites and whisk until foamy. Add sugar gradually to egg whites while beating on high until medium peaks form. Add 1/3 of egg whites to chocolate and mix well- until completely combined and smooth. Add remainder of egg whites and fold in gently until completely incorporated. 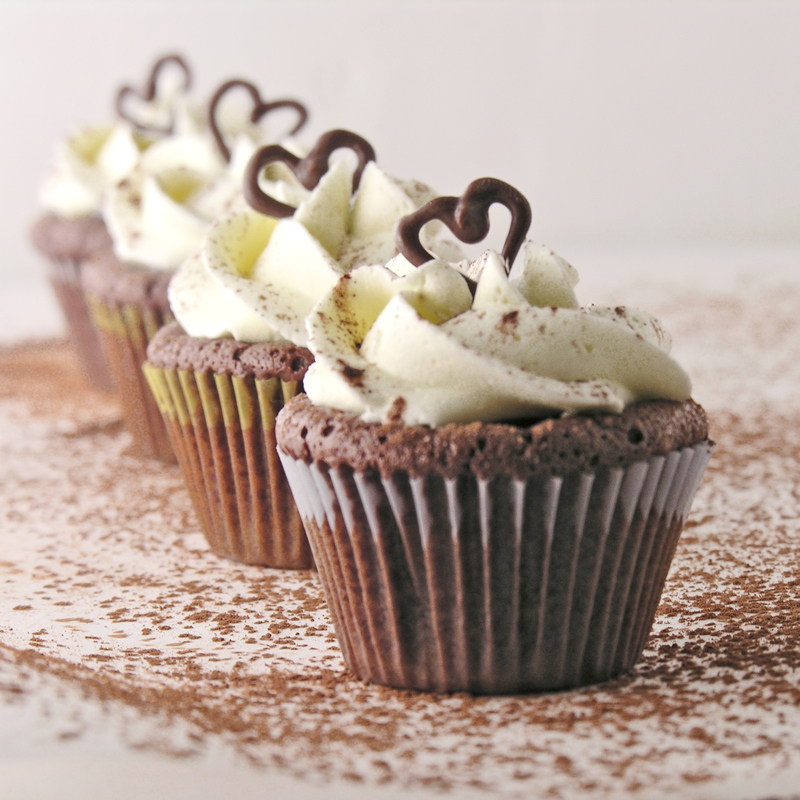 Spoon batter into mini-cupcake liners in tins and bake at 350 degrees for 10-12 minutes. To make the ganache, heat chips and whipping cream in the microwave in 30 second increments, stirring in between, until completely melted and smooth. Gently spoon or pipe ganache into the concave top of each cupcake until all ganache is used up. Make frosting by combining remaining room temperature butters with powdered sugar and vanilla and beating on high until light and fluffy. Pipe frosting on tops of each cupcake, covering the ganache. 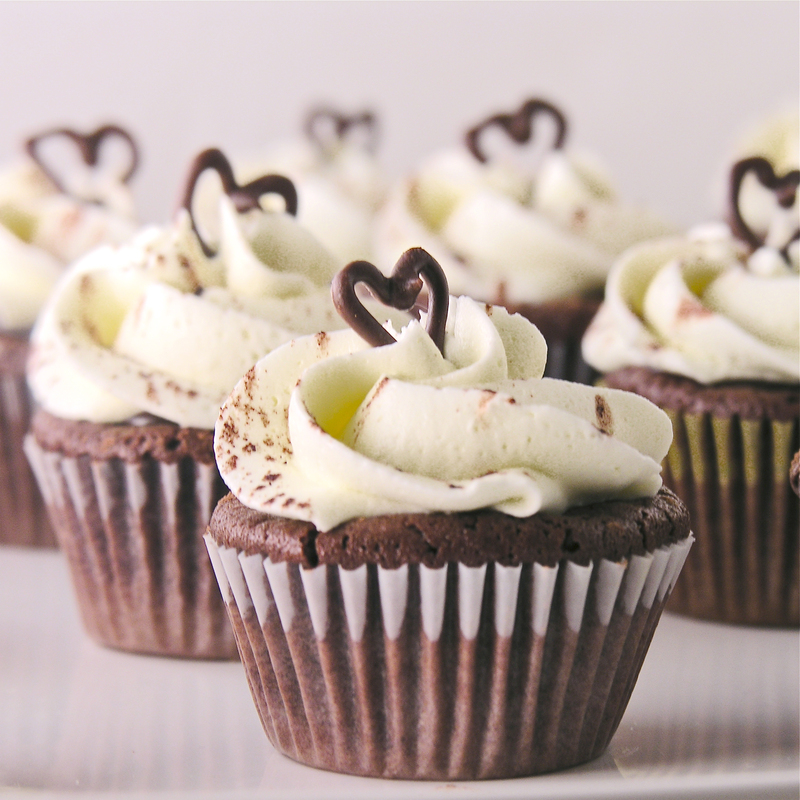 Posted in Cupcakes, Gluten Free and tagged baking, buttercream frosting, chocolate, chocolate chips, chocolate ganache, cocoa powder, cupcakes, dark chocolate, dessert, flour-less cupcakes, food, heavy whipping cream, mini cupcakes, rich chocolate cupcakes, whipping cream frosting. Bookmark the permalink. Those cupcakes are so pretty. I would suggest stevia as its natural and no calories. Splenda is full of chemicals! i loveee the chocolate hearts! I LOVE the idea of the ganache in the middle. That is so completely heavenly. And you piping skills are awesome! What kinda tip did you use? 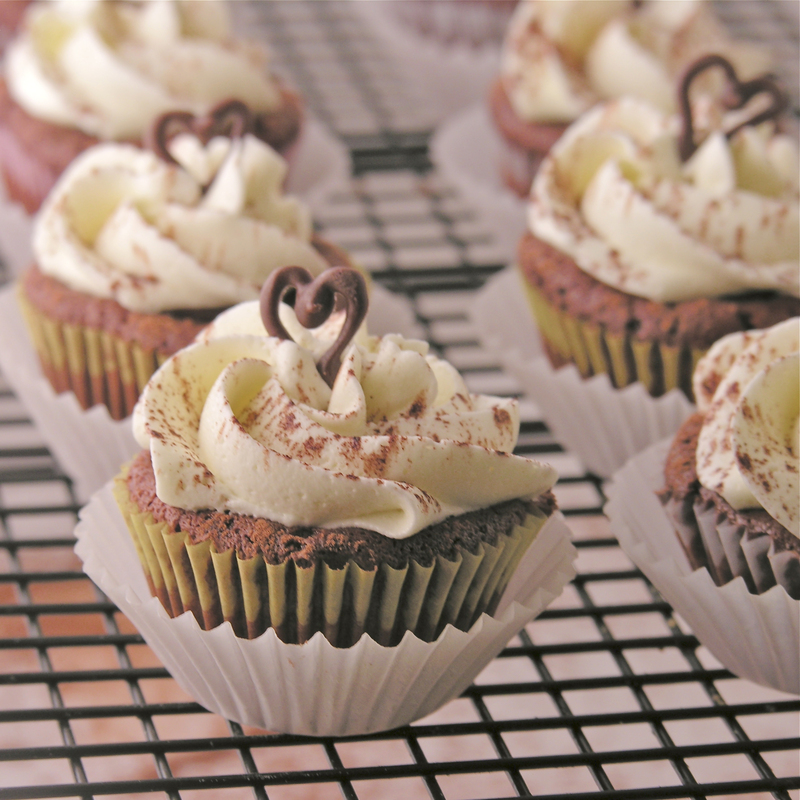 It’s a Wilton 1M tip– which is what I use on all my cupcakes. I wondered if it was too big for minis, but it worked just great. Elegant cupcakes and most definitely delicious! I want to try making those cupcakes tonight but I don’t have mini-muffin tins. How long would you bake them in regular size muffin tins? I’m sorry I didn’t respond more quickly- I was out of town…you’ll just need to experiment- obviously you’ll want to go longer. Good luck!!! Oh wow, they look so good!